Okay, there's more restaurant reviews coming even though it's been a while (getting a post ready about a place that has locations in Huntington Beach and Anaheim) and it might be kind of lazy to post Taco Bell news but I wanted to post something and they just sent me some news. I try to post what I get and I think this is the first time Taco Bell has actually sent me something. If you want me to post something about your restaurant then send it on in: reviews@ocmexfood.com. You don't have to be a corporate giant. You just have to be selling Mexican food in Orange County. Also, I do like that Taco Bell (yes, that Taco Bell) is trying to be more authentic, that they've hired an accomplished Latina chef and are willing to take input from her. It's Taco Bell and we all know what that means but they are trying. And that counts for something. The promo images here even showcase "Lorena Garcia" more than "Taco Bell." Actually they don't mention Taco Bell at all. That's a courageous move for them. It's like, if you want to get Chef Lorena Garcia's food then you can go to her restaurant . . . which just so happens to be in that place that's all over the place. 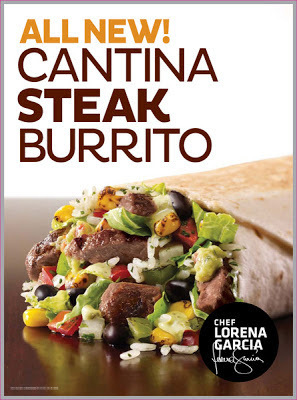 Anyways... they've just introduced this new Cantina Bell Steak Burrito. From the video below it looks like they put some effort into making it turn out right yet still quick and easy to make for a wide audience. Let us know if you try one and I'll update here if I'm able to grab one soon. 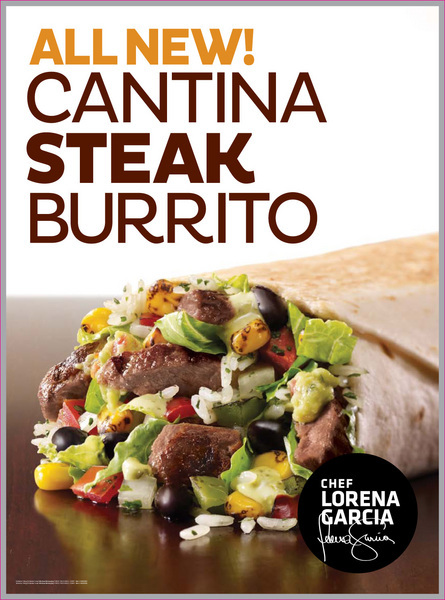 As part of Taco Bell’s commitment to quality and listening to consumers, this new steak is the latest menu item to Cantina Bell, which was launched nationally in 2012. 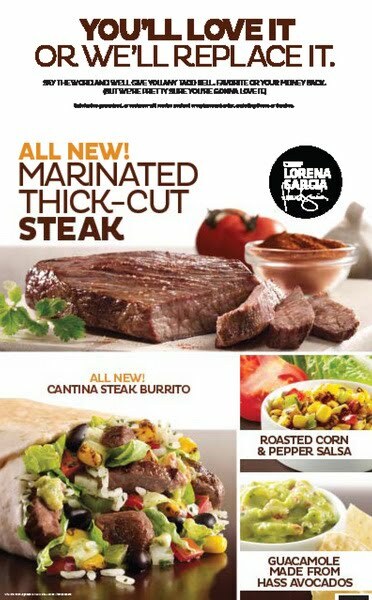 Taco Bell also introduces the NEW Cantina Steak Burrito featuring this all-new tender-braised thick-cut steak marinated in Chef Lorena’s signature recipe in addition to premium Latin rice, flavorful black beans, guacamole, pico de gallo, roasted corn & pepper salsa, romaine lettuce and a creamy cilantro dressing, all wrapped in a warm flour tortilla. Through our latest YouTube video, you can see how Chef Lorena Garcia and the Taco Bell team tested nine different versions of the steak in order to bring out the best balance in flavors and texture. Cantina Bell provides Taco Bell customers with an expanded menu of quality options at a great value—plus with the convenience of a drive-thru. The complete menu includes a Cantina Bowl or Cantina Burrito with either the all new marinated thick-cut steak or 100% all-white chicken, guacamole, cilantro rice, fire-roasted corn salsa, cilantro dressing, black beans, romaine lettuce and pico de gallo. Side combinations include: chips and pico de gallo or fire-roasted corn salsa, or chips and guacamole. Viewers tuning into pre-game of the Super Bowl XLVII on Feb. 3 can see a new Taco Bell spot, “Grande Papi,” which features the New Cantina Bell Steak Burrito and uses a Spanish version of the 1994 hit song "Big Poppa." Additionally, two spots “Finally” (TV, Radio) and “Start Over” (TV) will air in W2; Hispanic versions will also air.